This year we’re getting a good bit of GonerFest 9 bands rolling through town before the actual Goner happenings. Not trying to deter anyone from hitting Memphis later this September – merely just stating that you could probably catch a lot of fun in Nashy and then more fun in Memphis and that’d be tite. A couple of bands that fall under this category are Nobunny and Bad Sports. We mentioned a while ago that the two would be hitting across the country together and that it’d bring them to The End on September 26th, but now we’ve got the full bill for you and it looks to be a total party. 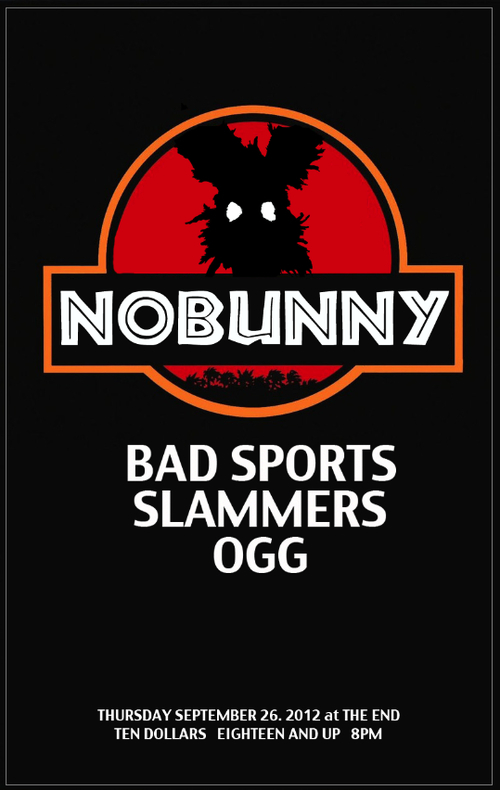 Slammers and OGG – two of our favorite local bands – will be the support for the night. We haven’t seen Slammers since early May when they played alongside Sonny Vincent at The Other Basement – so we’re extra excited to catch them back in action. You can get your tickets here right now – or just wait ’til day of.